I adore watching my four-year-old’s imagination run wild. She is a big fan of playing dress ups and not just princesses and fairies. She loves playing doctors. Little Goldie have just the kit for your doctor-to-be. Little Goldie are all about bringing you high quality toys and decor from independent craftspeople and designers, most of which is handmade and eco-friendly. More and more parents are seeing the value of wooden toys, due to their environmental sustainability. This is definitely a selling point for me.Their durability means they won’t be squished or easily broken so they are sure to last more then a week. It’s imaginative, fun and timeless and will open a whole new world of play for your child. 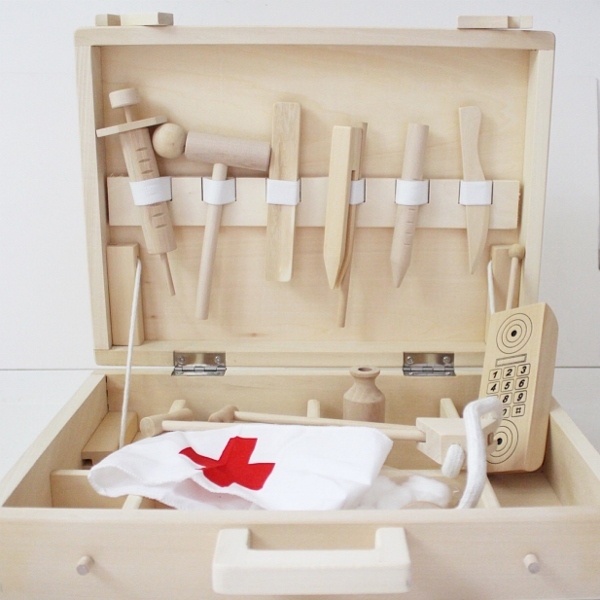 The kit has everything your little doctor will need, it comes complete with a wooden stethoscope, some dressing materials, lots of tools and a little notepad all packed neatly in a wooden carry case. Retailing for £31, these delightful doctor kits are available directly from Little Goldie, which ships worldwide.